It took me a while, in researching How People Have Tattoos, to come to terms with the idea that tons of people who get things permanently carved into their flesh don’t do it because it has any deep personal symbolism to them. I felt…. guilty, somehow, about the idea of getting a tattoo without knowing what every single stroke of it was going to look like, and where every line fit in my personal life philosophy. Of getting one just because I liked it; because it was beautiful. And this has become, in its way, part of the meaning of this tattoo: A level of spontaneity that I am not accustomed to accepting in myself, a lack of planning that is unusual for me. It’s… I commissioned an artist to do this, and now a piece of art that a really, really good artist made is on me, and is always going to be. There’s something about that I like – about carrying this thing that the person who made it also gets to care about. The act of getting this tattoo ended up being, just in general, a fuller experience than I expected it would be. I sound like a douchebag. I REALLY feel like I sound like a douchebag. And I haven’t even started talking down to anyone about mythology yet! Well– one of the things I like about Thor, and about the symbolism of him, and his place in the myths, is his confidence. Like, he’s not a person, of course– he’s not a confident person— oh my god how do I even explain this? He’s not written with doubt; he’s not made for it. It’s not a part of him as a character, as a mythological figure. He exists so firmly in his place; he fills up the space made for him so exactly and so relentlessly. And that’s what the hammer represents to me– I wear it when I think I can’t do something, and when I feel like an imposter. Because, like, motherfucking Thor wasn’t an imposter! It’s a reminder to occupy the space I want like I was made to be there. It’s why it’s on my chest – it was always important that I be able to see it, and to remember that. I talk myself out of many things because of small fears – not big fears, not the kind that make me unable to function, but ones small enough that they are too easy to avoid. I don’t need to be, like, mythologically epic in any way; that’s a lot to ask of anyone, much less a dweeby law student in 21st-century Chicago who read some books once and is not even a little bit a Viking. But I could, maybe, occupy spaces (classroom spaces, job spaces, courtroom spaces, social spaces) as though an entire belief system had once revolved around my being there. I could, maybe, get some mileage out of a physical reminder of that kind of relentless confidence. Thor’s not real. I don’t want to be Thor. I just want, on occasion, to be able to act as though I were written into my place – as though doubt could not exist in my world and in my relationship with myself. This was originally the only big personal meaning this design had. Since I started law school, it’s taken one more, that is a little more about Thor as a character and less as an archetypal abstraction. The Norse pantheon is, for the most part, not a friendly one. The Aesir don’t behave much like what we, today might think of as gods. They were real old-school pagan deities, the kind you mostly prayed to to ask them to ignore you, to lay the horribly heavy weight of their attention on someone who could bear it. Most of the surviving stories we have of them (for all they show heavy non-pagan influence) don’t involve any interaction with mortals in Midgard. The Eddas don’t treat much with humans, because most of the gods don’t treat much with humans. With the exception of Thor, who doesn’t just engage with humanity, but actively likes it. He’s the god of where everyone belongs, of maintaining order, of wrenching what is out of place back into the space it’s intended to occupy. He’s friendly and merciful and generous; a god whose symbol anyone could wear, for luck and for strength. 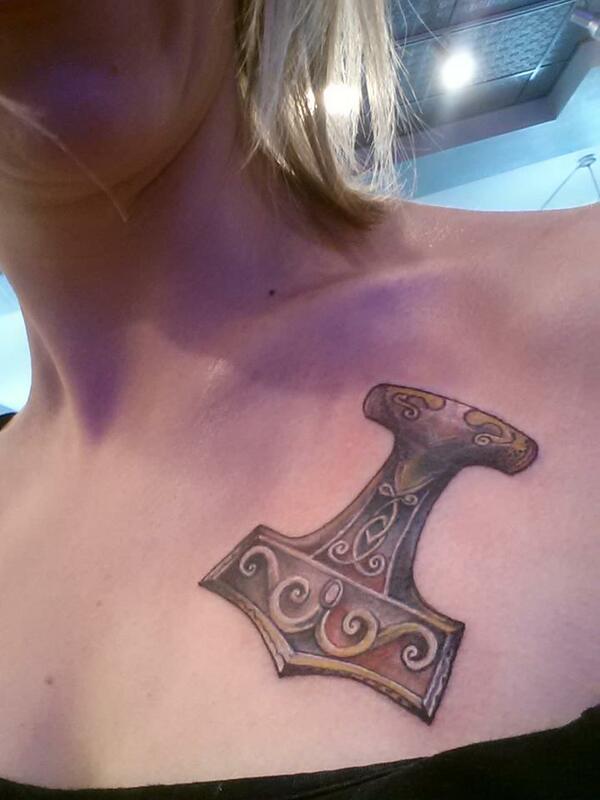 Odin was for the warriors and the wealthy; Thor was, to a greater degree, in my interpretation, for everyone. He’s not a god of justice or judgment or law, so much; but as someone going into the touchy-feelier side of the law, as someone who’s getting set to build a lot of her career on the idea that the law is for everyone, for absolutely everyone— the hammer just. Kind of picked up that meaning for me, at some point in the past few months. Mythological and archetypal and narrative and artistic; that’s the ~*~*~*~*~deep meaning~*~*~*~*~ behind the symbol I paid a man to carve into my flesh over the course of about two and a half hours. This isn’t, like, a speech I feel any strong need to make to anyone who sees the tattoo; I’m happy to have come to a place where I don’t feel any need to justify the fact that I got it to anyone. It’s beautiful! It’s absolutely beautiful. I can’t stop looking at it, and being glad that it is a part of my skin now. I’m happy that it means so many good things to me; and I’m happy that it is more (more!! mooooreeeee!!!) than beautiful enough not to need me to explain it.